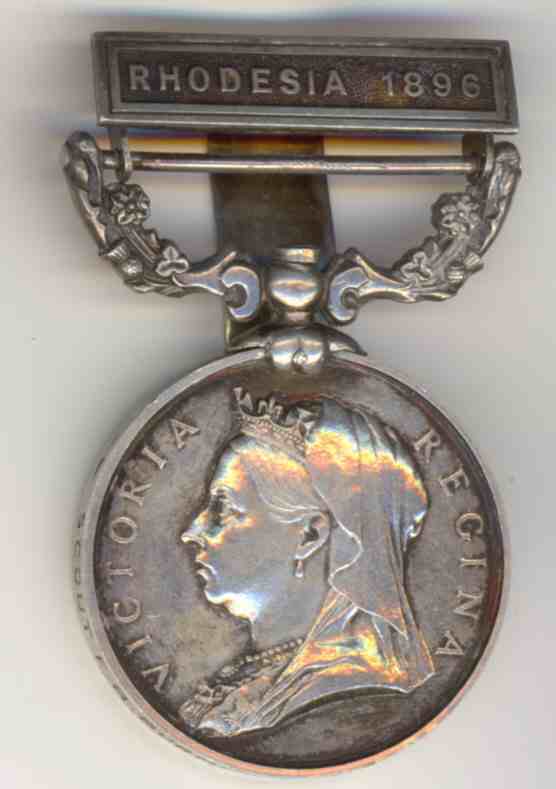 In our monthly study of the conflicts that lie behind treasured campaign medals, this month, we examine the conflicts behind the British South Africa Company Medal, 1896-1897. In 1888, King Lobengula of the Ndebele (or Matabele) tribe, whose capital was at Bulawayo (in modern Zimbabwe), was persuaded to cede all mineral rights in his territory to a group of British colonial venture-capitalists headed by Cecil Rhodes. In 1890, Rhodes dispatched a Pioneer Column of 700 settlers and BSA (British South Africa Company) police to begin exploitation. The initial target was Shona land (the Shona were nominal vassals of Chief Lobengula). But mineral deposits there were disappointing, so attention turned to Ndebele land, and in 1893, a BSA force under Dr Starr Jameson, one of Rhodes’ leading lieutenants, invaded Lobengula’s homeland, defeated his army, and annexed the territory for the BSA. The war was an extreme example of asymmetrical warfare, pitting very small numbers of BSA police equipped with new Maxim guns against very large numbers of traditional tribal warriors armed mainly with spears and shields. In one engagement, for example, 50 BSA police with machine-guns defeated an estimated 5,000 tribesmen. Following the First Matabele War – in one of the worst cases of ‘do-it-yourself’ imperialism in late 19th century Africa – the Shona and the Ndebele were dispossessed of their land and cattle by rapacious white settlers. An estimated quarter of a million Ndebele cattle in 1893 had been reduced to around 14,000 just four years later. In 1896, while Jameson and his BSA police were away mounting a raid on the Boer Republic of the Transvaal, the native tribesmen rose in revolt. Such was the extent of the revolt that the white settlements were almost overwhelmed. But Rhodes persuaded the Ndebele chiefs to attend an indaba (conference) in the Matopo Hills, where they accepted his promise to return their old lands, ordering their men to lay down their arms. The old tribal leadership had been largely destroyed among the Shona, however, and a new leadership had been provided by priests and spirit mediums. Here, in Mashonaland, the resistance was less easily gulled. The Shona continued to fight, though shunning open battle, fighting instead a grim guerrilla war. From inside caves located in granite hilltop refuges, they would fire antiquated firearms or stab with assegais through cracks in the rock at the BSA men hunting them. The most notable recipient of the British South Africa Company Medal – which was authorised by Queen Victoria in 1896 for the First Matabele War, and again in 1897 for the Second – was Robert Baden-Powell. He first developed his ideas about scouting during service in the Second Matabele War. He later served in the Second Anglo-Boer War (1899-1902), organising the plucky and headline-grabbing defence of Mafeking.